This is a colorized shaded-relief of the original Lunar Orbiter Laser Altimeter (LOLA) Digital Elevation Model (DEM). 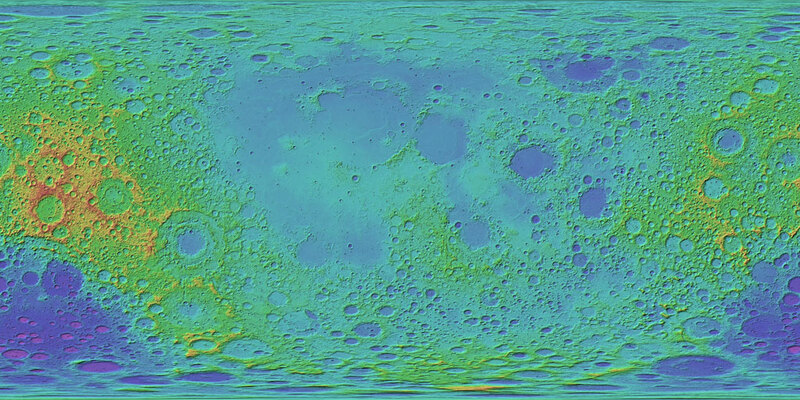 The DEM is a shape map (radius) of the Moon at a resolution of 128 pixels per degree, based on altimetry data acquired through September 2011 by the LOLA instrument. The ground tracks were interpolated using the Generic Mapping Tools programs "surface" and "grdblend". The map is in the form of a binary table with one row for each 0.007813 degree of latitude, pixel registered. Map values are referred to a radius of 1737400 m.
The Lunar Orbiter Laser Altimeter (LOLA) is producing a high-resolution global topographic model and geodetic framework that enables precise targeting, safe landing, and surface mobility to carry out exploratory activities. LOLA characterizes the polar illumination environment, and images permanently shadowed polar regions of the Moon to identify possible locations of surface ice crystals in shadowed polar craters. The LOLA instrument has a along-track sampling in latitude of 25 m. Cross-track sampling in longitude 0.04 degrees (~25 m above latitude 85 degrees; and ~1.2 km at the equator), after the first year of operation. Along with each gridded DEM, a "count" image is created which reports, at the chosen resolution, how many LOLA shots intersected that pixel. If there are more than one shot per pixel, the mean of the shots is used per pixel. Where no LOLA shots are available, the pixel is approximated using a spline interpolation from the surrounding neighbors. This is a preliminary product. (1) gdaldem hillshade input_dem output_hillshade -z 2 (ZFactor) -az 315 (Azimuth) -alt 45 (Altitude) (2) gdaldem color-relief input_dem color_text_file output_color_relief_map > (3) hsv_merge.py output_color_relief_map output_hillshade output_color-hillshade.